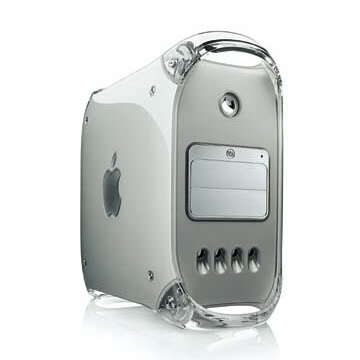 The Power Macintosh "Power Mac" G4 1.0 (Firewire 800) is powered by a 1.0GHz PowerPC 7455 G4 processor including "Velocity Engine" vector processing, 256k level 2 cache and 1MB of DDR SRAM level 3 backside cache. Base system configurations had 256MB of RAM, a 60GB Ultra ATA/100 hard drive, a 12X DVD-ROM/CD-RW "Combo" drive plus a 4X AGP NVIDIA GeForce4 MX graphics processor running 64MB of DDR SDRAM. These machines came with a single Firewire port plus offer optional AirPort Extreme (802.11g) and Bluetooth 1.1. Optical Disk 12X "Combo Drive"
Expansion Bays 4 3.5", 2 5.25"